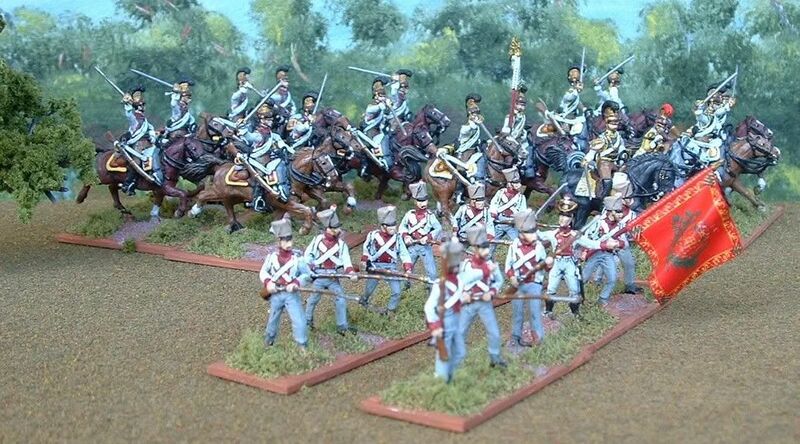 Here is a simple conversion of French Light Infantry (HaT 8042) into Saxon Line Infantry from 1813. The epaulettes and plumes were removed with a sharp knife and shako covers added with glue. They have been painted with red facings as the 1st Battalion of the 1st (Koenig) Regiment. A less useful pose from the French Light Infantry was turned into a standard bearer and another advancing pose with a sharp knife and hot water. Saxon infantry advance, as Kuirassiers from the Leib and Zastrow Regiments charge past in the background. Many thanks to Mr. Dearn.